Thought Id start a little thread to keep tabs on my ownership of the car. 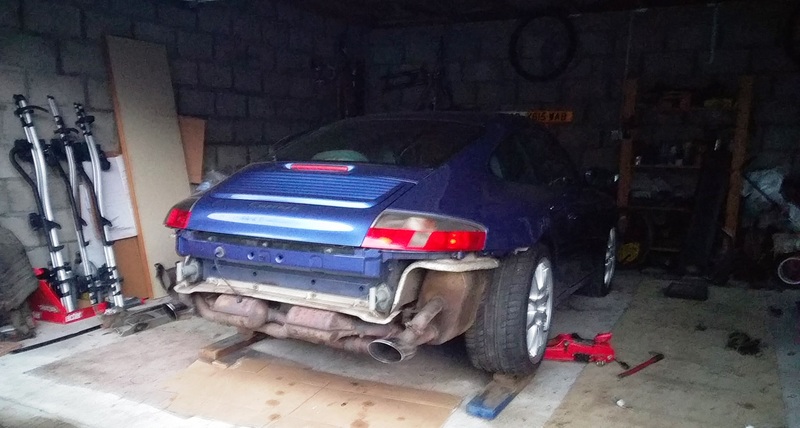 Having previously owned a 996 C4s and Boxster S I was on the hunt for another 911. This came up locally and seemed good on paper but it took me 4-5 weeks to have a look at it. When I did I was a little hesitant as the bodywork was a little rougher than I hoped for. Thought about it for a few days then put in an offer that worked for me given work required and it was accepted. Id kind of wanted a little project to work on as well so wasn't looking for anything perfect. 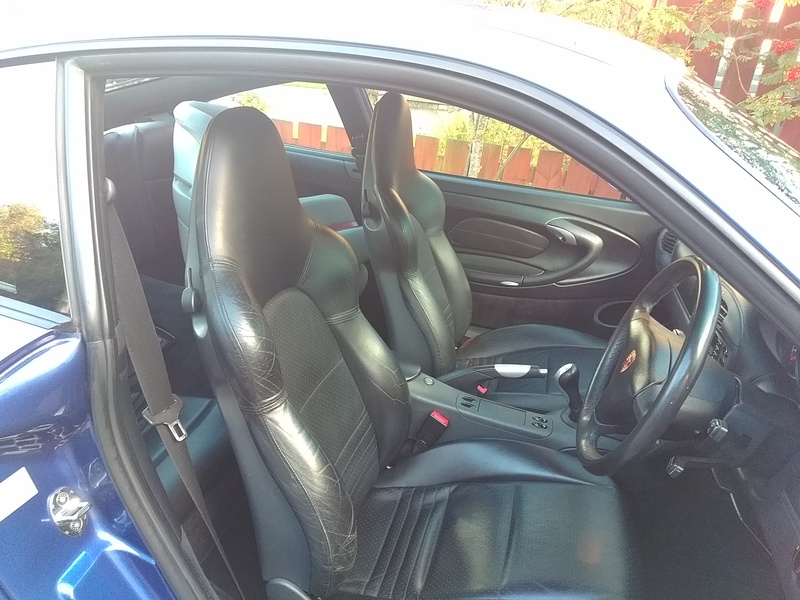 Base spec of the car is Zenith blue, 3.4 cable throttle with sports seat black interior, M030, Sport Design wheels and factory LSD/TC set up. 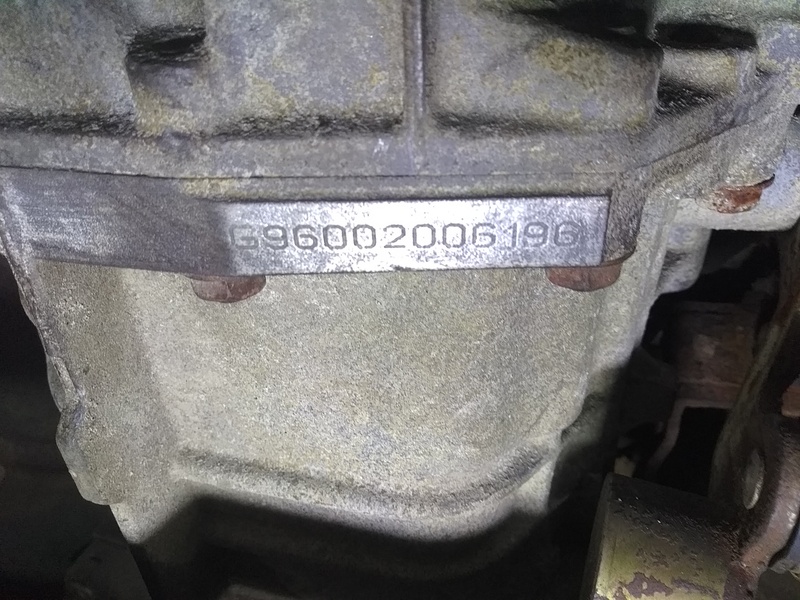 Main thing for me was the engine had been replaced by local OPC in 2010 (bore scoring on cyl6) with a new one so its only done 30k on that engine, its an AT code so apparently it has the later non serviceable IMS bearing as well as a few other later changes. Sadly the original gearbox gearbox was whining a lot so the gearbox was replaced with a good 3.4 unit with LSD, original was apparently so worn it was not doing anything. Clutch slave, new arm etc were all done at the same time just before I bought it. - 9mm front spacer and 15mm rear spacer. - Cleaned and treated the leather. - Cleaned and treated any small rust bubbles to prevent spreading. - Door striker gaskets to prevent rust. Issues so far are loose / detached AC pulley center which Ive removed and bought a new pump to put in. Clutch has started slipping so looks like I'll need to do that soon (its on 90k miles) and looks like one of rear silencers is cracked so that needs welded. Ive also got a sticky tappet when cold so I'll monitor that but it seems better with new oil. - Fit the LTT thermo Ive got sitting. - OZ Alleggerrita 18in wheels in titanium. - 200cel x-pipe cats mated to the Gembella silencers currently fitted. - Sort paint - front bumper is quite bad but might just get both side done on the car so its all nice. - Retro style side decal in matt grey to match wheels. - Door mirrors replaced to tie into wheel and stripe colour. That's about it then I think. Just drive and enjoy for a few years and then take stock. Any feedback or suggestions welcome. I'll add some photos later as well. I am really looking forward to hearing more about your car. I still think the early 996 is under appreciated as a great drivers car without all that electronic guff which came wth the later models. 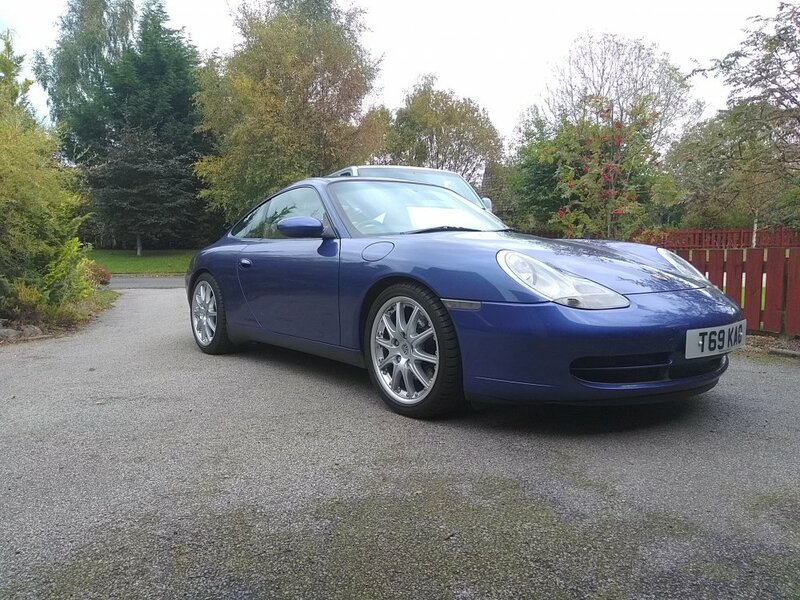 I still think the early 996 is under appreciated as a great drivers car without all that electronic guff which came wth the later models. Here here! 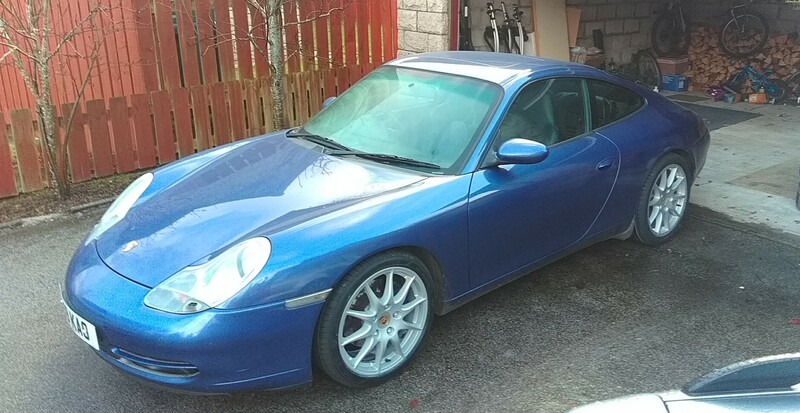 a car the DIY owner can work on and maintain without the intervention of dealers and uneccessary eletronic gubbins - and its a Porsche! Might do this if I can find some nice Fuchs. (minus the arch decal) or use dark OZ's instead. Ah! a new member to the 3.4 cable throttle manual C2 ferrous piston coating club! Car looks great, I was looking for that colour (well really anything not black or silver) when I bought my MY99 vesuvius c2. It just rolls off the tongue that Wasz. Yeah I didn't want black or silver either. Ideally cobalt but I've really grown to like the colour, pictures really don't it justice. To be honest I see the IMS as an advantage as far as I'm aware the very last one have very few issues as well so it's not an issue for me so I hopefully have best of both sides from bore scoring and IMS. 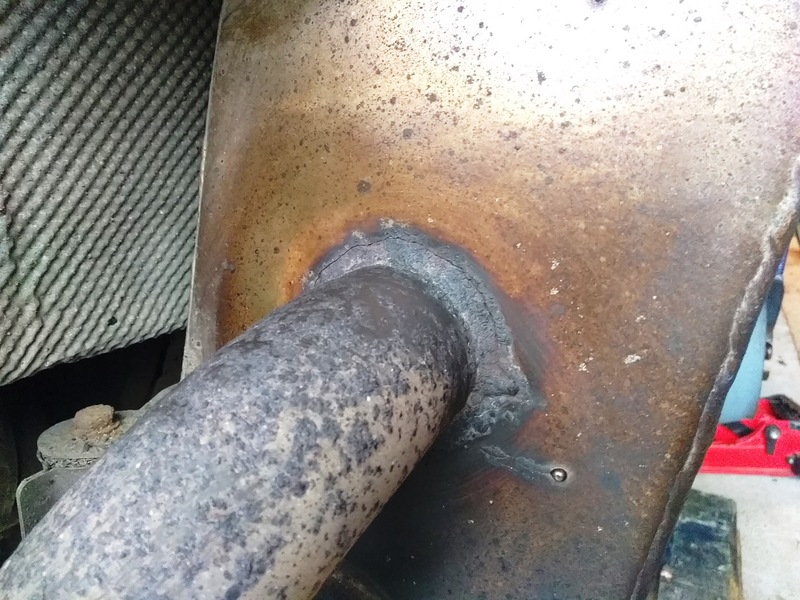 So rear bumper stripped off tonight to check exhaust and as I feared the tailpipe exit pipe coming from the silencer box has a hairline crack around so that will need welded. I had to drill out every bolt head as they were all knackered so all new proper bolts used instead of Phillips screw heads and new speedbolts ordered as well. Most of the exhaust bolts appear to have been part of the Titanic so not sure whether to just go and get the X-pipe and new cats now or wait as a really cool set of rare wheels are tempting me. Offending crack and as it sits, very tempting to just rip out that old exhaust and go all new. are those Dansk brand boxes perchance? Certainly not original. Weld them if you are not keeping the car long, or replace if you are, nothing worse than doing a job twice. When my originals went, I waited on eBay for as near to "new take off" exhausts out of someones garage. I scored one brand new and the other lightly used. I figure the originals lasted 17 years, so compared to some of the aftermarket stuff like those, represent a better choice. These are stainless Gemballa exhausts so trying to weld them up in situ to save breaking anything out. Other than the crack there in good condition. If replacing I'd probably just got Topgear boxes with the x-pipe and 200cell cats. So it seems I do have a replacement 3.4 box with LSD not the 3.6 as thought. Contacted previous owner who had spoken to a breaker who had two boxes available, a 3.4 with LSD and a 3.6 but the 3.4 sold so they were to send the 3.6 box. However it seems they did indeed sent the 3.4 with LSD so the car retains the factory spec which is quite nice to have. Just keeping this thread up to date. - Fit the LTT thermo Ive got sitting. - Still to do. - 200cel x-pipe cats mated to the Gembella silencers currently fitted. - Crack all repaired on current silencers. - Sort paint - front bumper is quite bad but might just get both side done on the car so its all nice. - On hold. - Retro style side decal in matt grey to match wheels. - On hold. - Door mirrors replaced to tie into wheel and stripe colour. - On hold although I might try some black ones. I found some Panamera wheels locally so decided to fit them with new Goodyear F1 Assy3's. The sport designs are sold. As per other threads I found some bits in the oil/sump so monitoring that before spending anymore money on the car. If all is well I'll go exhaust next then might look to lower it further to x-74 spec springs or H&R. Bought a powerflex gearbox mount insert as well. Oh and the clutch is still to do as well. Quick check of sump plug revealed nothing so Im confident no bottom end issues. To celebrate Ive ordered some 200cel cats with x-pipe from Topgear. Std bore. Fingers crossed for you C. Looks like you should be ok though. Those Panny wheels look good. 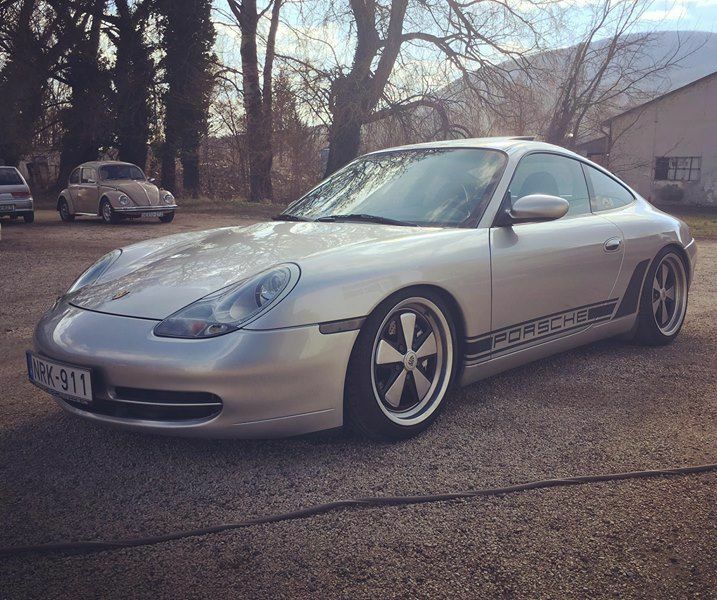 Nice project thread Coullstar, the cars going to look great when your done mate. Really liking the new wheels and good news about the sump plug findings.